The Asian Canadian Asian Migration Studies program invites you to join us at it’s first academic ACAM journal launch, The ACAM undergraduate journal is a new student-run publication that reaches across various disciplines, genres, and forms, to consider topics around Asian and Asian Canadian identity. The journal seeks to recognize and encourage dialogue around these topics, and to grow as these dialogues continue. Submissions from all UBC students, disciplines and cultural contexts at are welcome. 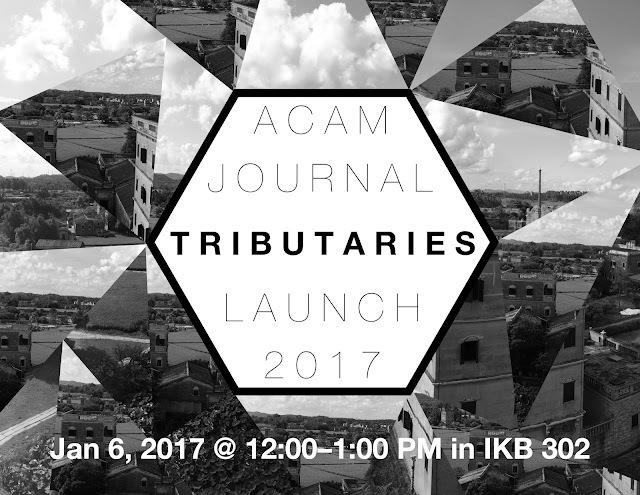 The inaugural issue, “Tributaries”, features collected poetry, short stories, visual art, and essays. This event will be taking place on the traditional, unceded, ancestral homelands of the xʷməθkʷəy̓əm (Musqueam) First Nation.